NEWBURGH HEIGHTS, Ohio — Newburgh Heights resident Willie Griffin contacted News 5 Investigators after she went without cable and phone service for more than week. A Newburgh Heights police report indicated her neighbor, Ron Quinones, admitted to causing the damage, and initially refused to let AT&T crews on his property to make repairs. Griffin said an AT&T repairman told her Quinones would not allow him to restore her service. "I never ever, ever experienced anything like this, I just can't believe that this happening," said Griffin. "He told the AT&T guy, that yes he cut the line, and that he's going to cut my neighbor's line, and any line that's running though his yard." Newburgh Heights police responded quickly to try an officiate a resolution. Quinones told News 5 he did not admit to cutting the cable line to his neighbor's home, and would not allow the initial AT&T repair person on the property because he was rude. Quinones also said he didn't want repair people on the utility pole at the back of his property because it was unsafe. 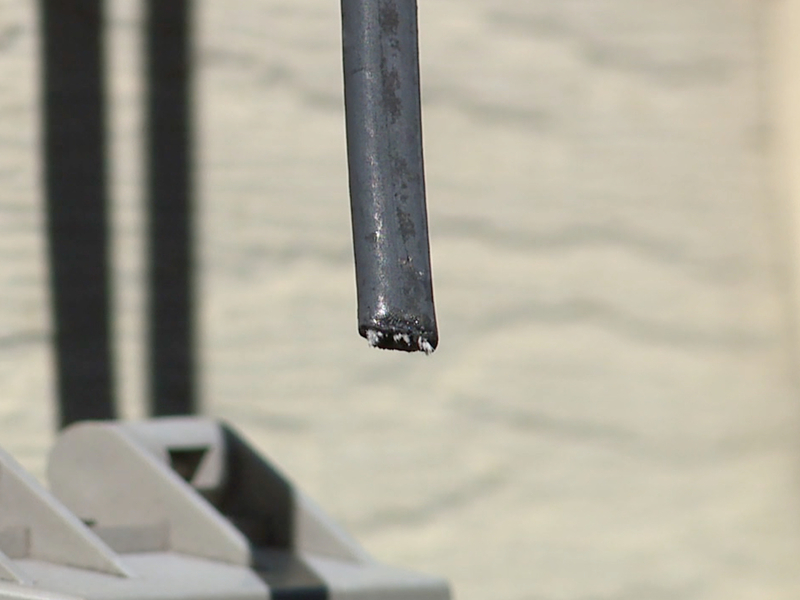 Quinones showed News 5 the leaning utility pole, which is owned by FirstEnergy, and said he believes the pole, which services several homes, needs to be replaced. Quinones said he is also concerned about how low the wires are hanging in his backyard. "The first guy that came out was very disrespectful, didn't have no class to him, and that's why I asked him not to even come in my yard," Quinones said. "Definitely it is a big concern, it's a safety issue for not only me, but surrounding neighbors as well." News 5 contacted FirstEnergy and AT&T headquarters about this case. FirstEnergy told residents it checked its utility pole and found it to be safe, and told News 5 it would never allow an unsafe pole to remain in service. Quinones later told News 5 he would allow and AT&T crew to restore phone and internet service to Griffin, and AT&T responded; a crew was on the scene two hours later to make the reconnection. "If the cable goes through and he can get it up there without damaging my property, I don't have a problem with it," said Quinones. Griffin said she appreciated Newburgh Heights police, AT&T and News 5 for getting involved. Meanwhile, Newburgh Heights police and FirstEnergy sent out a reminder to residents that cutting or tampering with utility lines is not only dangerous, it could also result in criminal charges.